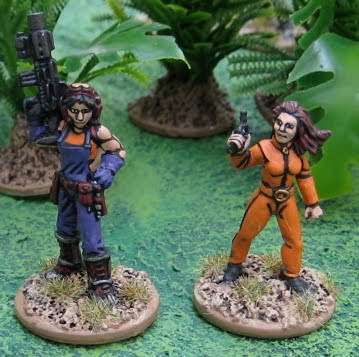 Another couple options for Amanda’s replacement… The one on the left is from Reaper Miniatures Chronoscope line. The figure came with an open hand and the option of the BFG (shown here) or a Big Dang Wrench (one end would be held in the hand and the bulk of it resting on her shoulder). The figure on the right is from Artizan Designs Kiss Kiss Bang Bang line. A couple Catachan Imperial Guardsmen (Guardspersons?) 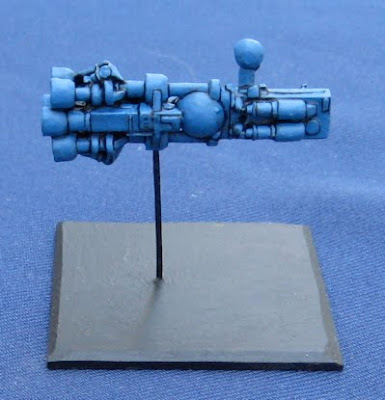 from Games Workshop (pictured here completely without their permission!) 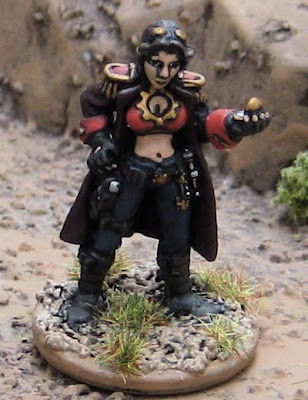 Actually the girlie with the big dang laser cannon is pre-catachan/cadian/valhallan/etc… She’s actually one of the Old Guard that I recently stripped for repainting. There’s one for sale on ebay at the moment… it’s currently £12 (+£4 shipping to Canada)?! 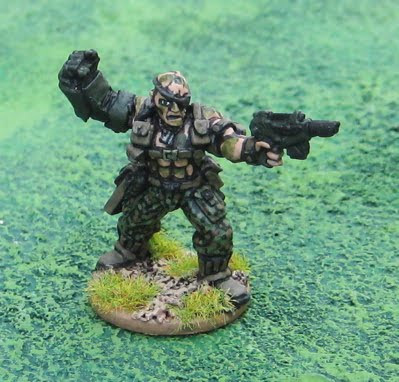 The other chap with the Plasma Rifle is a more recent Catachan. 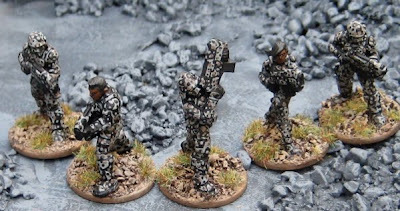 Speaking of Imperial Guard… and ebay… Three Catachan Sentinels arrived in the mail yesterday. I won a total of four of them all on one day last week on ebay. The grand total for all four (including shipping) was ~$35CAD… approximately the same as the suggested retail in CAD for ONE!? Why four, you might ask?! Well, honestly, I didn’t really expect to win ANY of them!? 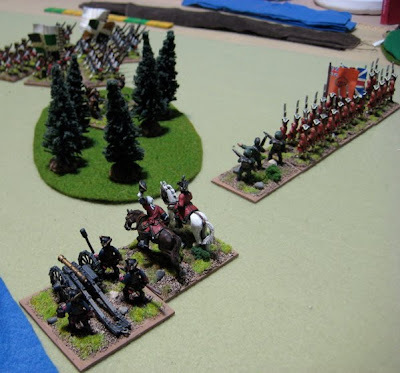 The next week will be a mad scramble to get everything ready for the Hordes of the Things Campaign which will be taking place ONE WEEK FROM TODAY!! These lads are from Artizan Designs Kiss Kiss Bang Bang line. They could potentially see use in the not-to-distant future as starship crew in my space campaign on Savage Saturday. Another character for the aforementioned Space Campaign. 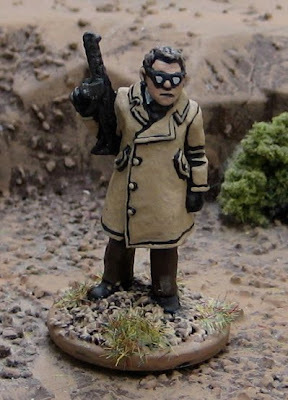 The figure is from Reaper Miniatures Chronoscope line which has a lot of bizarre odds and bits…? (Amanda needs a new character as Abby “Ace” Grace got her heab bitten off by zombies and then riddled with 10mm explosive-tipped caseless (Standard Light Armour-Piercing) rounds last adventure). Another of the old Grenadier Stellardate: 2998 minis. I think this one was called the “stiletto”. 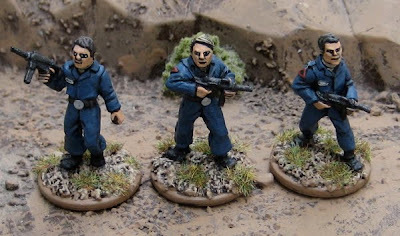 These are I-Kore Void Viridian Strike Commandos. They are apparently still available from Scotia Grendel. I now have ten finished and have another dozen to go! At the same time I’ve been working on sci-fi stuff for some new campaign options at Savage Timmy’s Playhouse! These are old Games Workshop/Citadel plastic Elves. While I knew these were Void miniatures from I-Kore, I had forgotten what faction they were as I had long since disposed of the blisters they came in. I thought perhaps they were Viridians but I had two other types of troops that I knew were Viridians (Commandos, who are much more lightly equipped, and Assault Marines, who are in power armour) but none of the equipment really matched… so I wasn’t sure…. 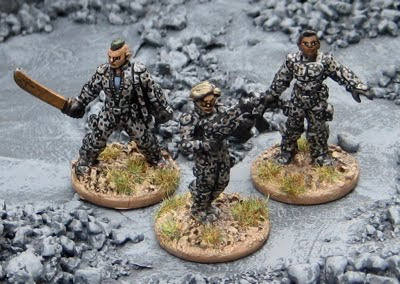 Anyway I found out that Scotia Grendel is still making these “Void 1.1” figures and these are indeed Viridian STRIKE Commandos…. Not that I care to play Void, or know (or care to know) anything about Viridians… It’s just helpful to know what they are should I ever decide to add to the force! 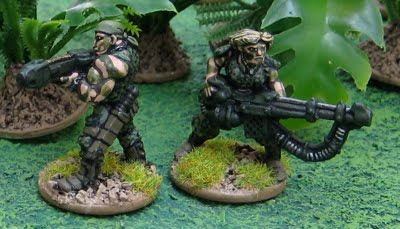 The regular old (not-so-striking) Viridian Commandos – due to their similar light order of equipment, including scantly clad chests - will probably get lumped in with the few GW Catachan Imperial Guardsmen that I have. Carrying on with the sci-fi stuff…. I've been having a hankering to play some Sci-fi skirmish gaming and have started painting up some more "modern" Imperial Guardsmen (more on that in a moment) and I've been thinking it's about time I updated these... so their off to the Pinesol bath shortly and I kind of wanted to have some record of what they originally looked like. I have no idea of the manufacturer of this ship. I’ve had it for at least 20 years and for most of that it’s been sitting in a box of junk, half-painted. The base I made for it might seem a bit huge, but I made it pretty big for a number of reasons. For one I have a very big game table - space ships really shouldn't get all that close anyway. Bigger = more stable- lee likely these big ships will tip over on the table or in the storage drawer. Also It will keep them from being knocked about into each other when in the storage drawer. 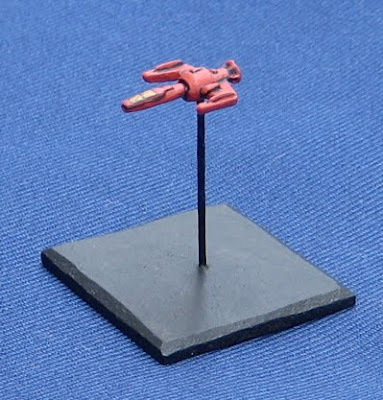 Lately I’ve been having a hankering to play some starship combat so I dug this, and a couple others, out of said box o’junk to paint up and fly around the galaxy (oh, and I picked up a few more off ebay, which should be arriving shortly…). I’m not entirely sure what system I’ll use. 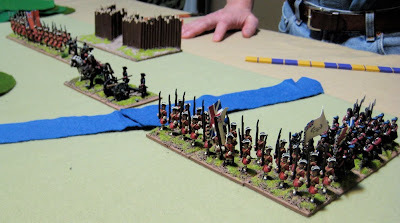 It will likely be Savage Worlds as we’re all familiar with it… with a few tweaks we were able to have some pretty darn awesome sailing ship battles…. I stayed up altogether WAAAAAY too late last night (and then an hour or so this morning when I finally got up….) trying to finish off a PILE of ruined city terrain I started last year but never seemed to get around to finishing up. I was motivated by how much fun we had last week on Savage Saturday. These are all scratch built out of MDF (with lost of carpenters glue, pebbles, and acrylic paint….). 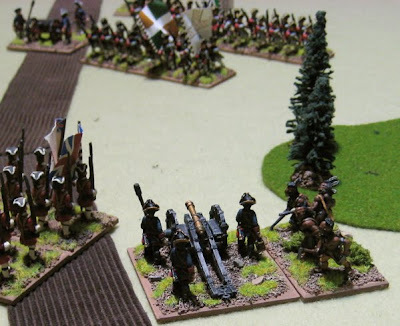 After Last Week’s Battle I got pretty pumped about playing more Seven Years War battles with the DBA 1500-1900 Extension. This week Gary and Rick showed up as well as John. Gary and Rick decided to play a game with similar forces as John and I had played with last week. 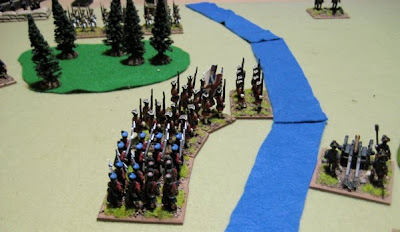 …while the remaining battalion of infantry and the artillery remained on the north side of the river with the army’s camp. 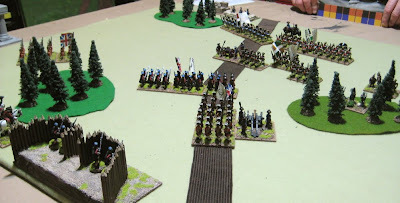 Not liking the looks of marching sraight into the the cannon the British Battalions north of the river formed a great big column and started marching off. 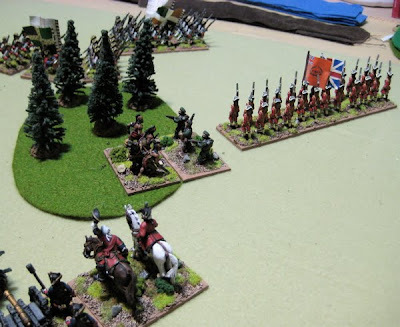 The British forces in front of the fort advanced cautiously to meet the advancing French. At the extreme left of the line, where the rangers were skirmishing in the edge of the woods, the French allied Indians attacked!! 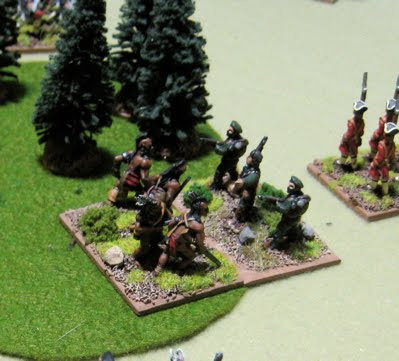 The swiftness of action and ferocity of the rangers drove them off, and they retreated deeper into the wood. 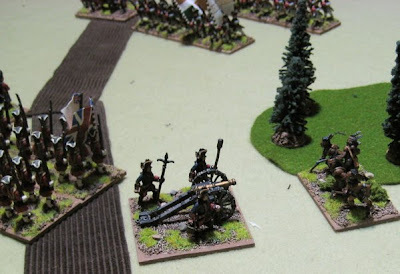 The French artillerists maneuvered their guns to fire on the column marching past – their opening shots caused severe casualties among the first companies of the Highland Regiment! (Gary’s six to Rick’s one will do that…). This also briefly disrupted the column. 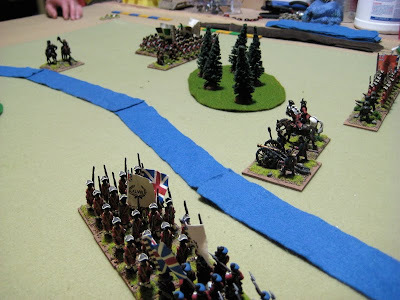 But the ever cool and collected under fire Brigadier Lowell quickly had them on the march again (I swear I have never seen so many sixes rolled for PIPs! Rick actually asked if he could take my die home…). So gallant and dashing was Brigadier Lowell, that he ordered his staff to follow him in a headlong charge into the woods to aid the Rangers pursuit of the Indians! Of course when cornered the Indians fought back viciously and both the Rangers and Command Staff were obliged to retire. 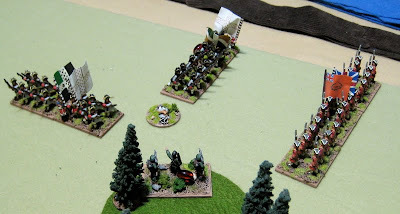 But the rangers had set an ambush for them and very nearly wiped them out. 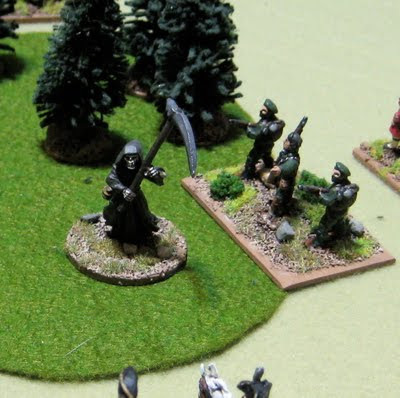 The scattered survivors faded into the woods naught to be seen again in this battle. The British column north of the river then wheeled to cross the river – apparently to turn the flank of the French advancing on the fort. 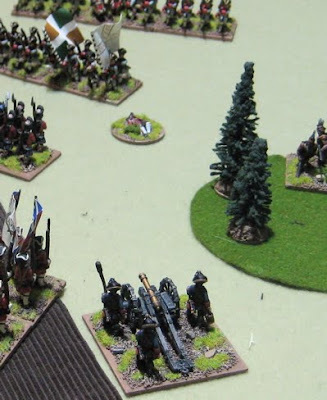 This forced the French onto the defensive and compelled to redeploy to meet this new threat. A bird’s eye view of the general situation. 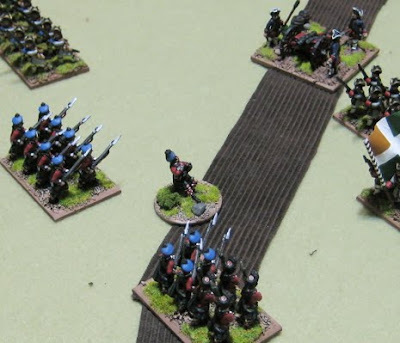 The first exchanged volley of musketry forced a back the French (one stand being forced right off the table…). 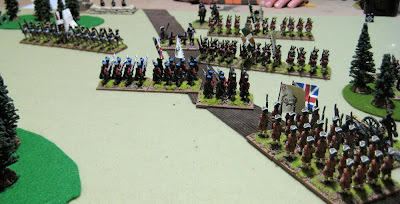 The French redeploy into to lines. 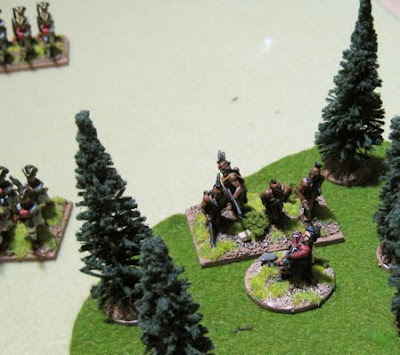 Sniping rangers from the woods took a heavy toll on the already shaken French and when news arrived of their commander bing mortally wounded the French retired from the field. If the French forces in the new world continue to perform in this lack-luster fashion they will not long remain in possession of New France! 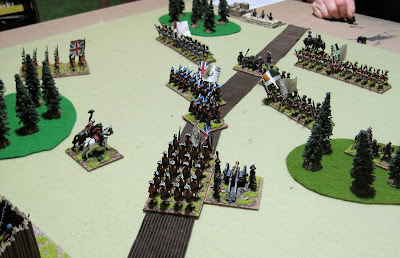 I have Elves on the Workbench at the moment… but I could see British being next in line so I can finish up enough to have TWO commands of both British and French so we could play a Horse and Musket BIG BATTLE!!! 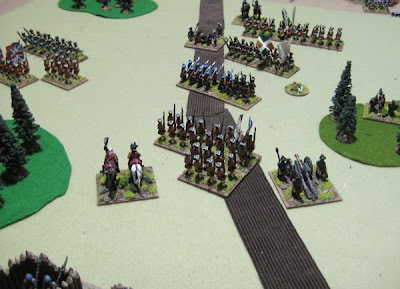 I'll have to get some more cavalry from John to add some HORSE to our "Horse and Musket" battles!! 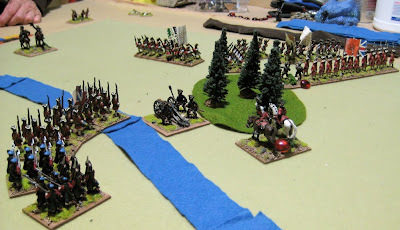 In the lists it looks like it’s mostly Shot and Blade/Warband, and a Light Horse and a Dragoon? 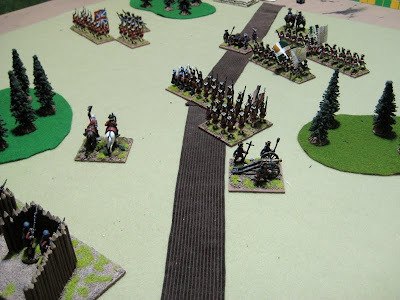 No muskets or Jägers… There is an option for Psiloi… Psiloi with Muskets…?! 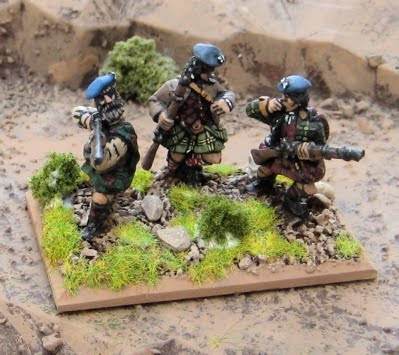 These are some ECW-ish era Scottish Moss Troops. Ready to ravage the lowlands... Norhtern England... the highways and byways of Luteland! The figures are from Old Glory. 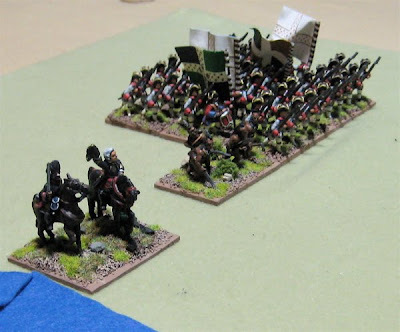 I have six more and I’m not sure if I should make them into three more Light Horse stands like these above… or into two Cavalry stands (3 per base). I think he said the figures were from RSM figures…? 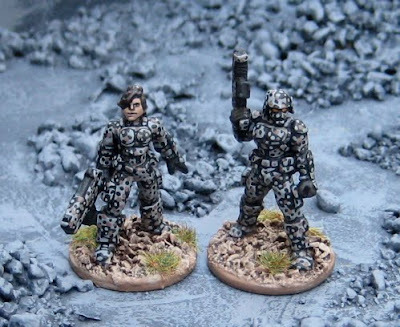 I can’t remember… Anyway I have a few more to do, but these were assembled and primed so I painted them up last night. 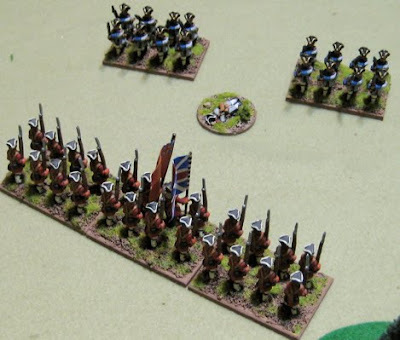 In an effort to get one more “British” unit done for this (last) evenings game I cranked out a battalion of Highlanders. 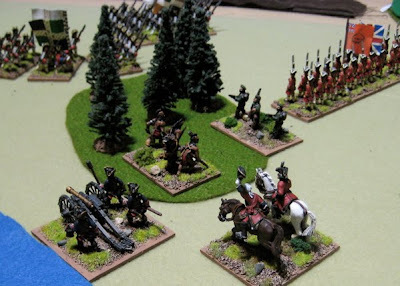 These are the 78th Regiment of Foot (Fraser’s Highlanders) one of three regiments of highlanders raised to fight against the French in North America during the Seven Years War. There is some debate as to whether they wore plaids of the government sett or the Fraser sett. I’ve gone with the Government sett (mostly because it’s easier…). These figures are all from RAFM. I actually have another stand worth of these to paint up. 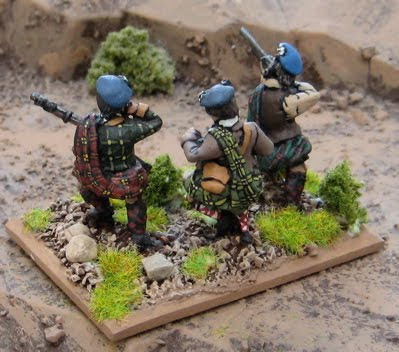 I think this was because in a few Orders of Battle for the siege of Quebec and the battle on the Plains of Abraham, the 78th Highlanders were listed as having considerably more troops on the roster… I’ll finish up the additional jocks later this week, perhaps, just to get them out of the way. I changed the game night to Wednesdays, because that, apparently, was supposed to work better for more people… and stayed up until 2:30 this morning trying to finish up the Highlanders… and then only John showed up – which was fine (quality is always better than quantity!). 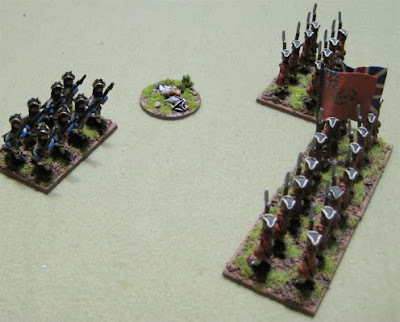 For this first crack at it we took more or less equal forces and didn’t bother with the troop quality/limited recoils we’ve used in gunpowder era DBA games. 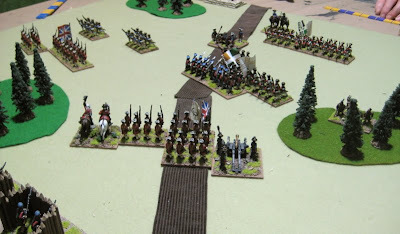 John wanted to played the French so I played the British. We diced for who was attacking and it was the French. So I set up Fort Ofwego and deployed my forces! 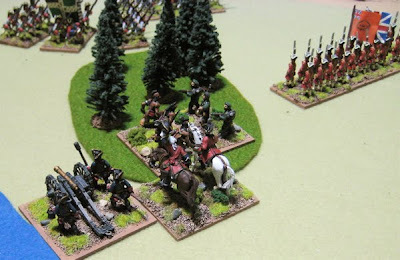 The British prepare to defend Fort Ofwego. The first volleys are exchanged between the French and the Highalnd battalion – looks like the Jocks took the worst of i! 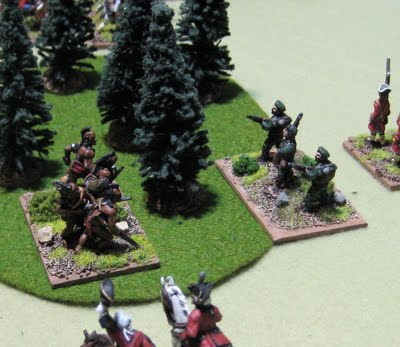 After a brief nasty skirmish in the woods the French allied Indians overran some apparently inexperienced British rangers! 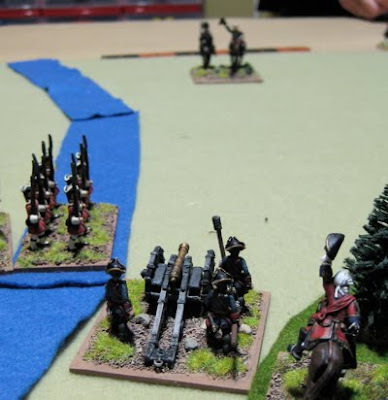 More exchanges of musketry and cannon. 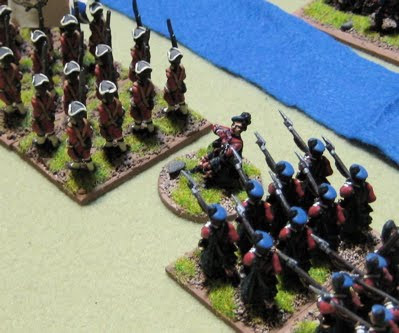 Then the tides started to turn as the French battalion on the right flank took some serious losses. 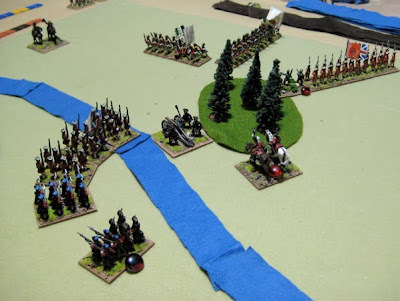 The melee between the French and the Highlanders in the center intensified! 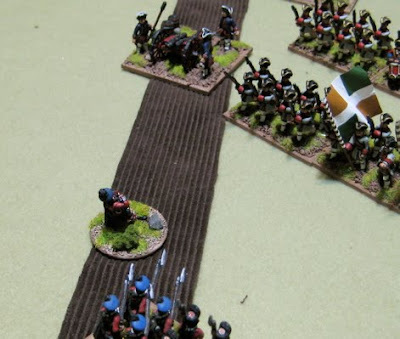 Some cannoning brought down anther stand of French men evening up the odds. 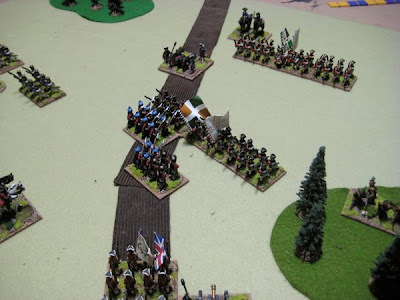 …then the French battalion on the flank lost another. If either side lost one more it would all be over! 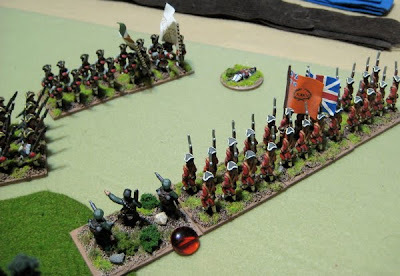 Things looked grim when the Indian allies finally came out of the woods and attacked the British guns!!! ...and then turned their guns on them and blew them apart with canister! 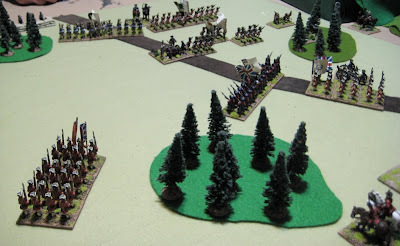 At that point the French gave up their attack on Fort Ofwego! 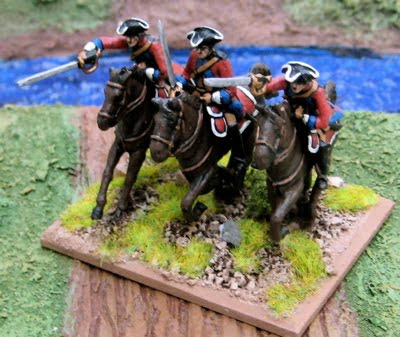 Some better pics of the new Jocks… then probably a few more Horse and Musket era troops – some cavalry… a few more highlanders… then back to some fantasy things for the campaign, which is coming up in just FOUR WEEKS (I guess I better get on with those rules revisions)!